The Wii U Pro Controller is a controller of the Wii U that can only be used in the Battle Dojo mode in Splatoon. 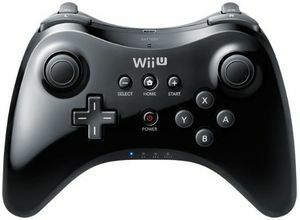 The Wii U Pro Controller is an optional accessory for the Wii U that serves as an alternative to the Wii U GamePad. It replaces the Wii Classic Controller Pro, and was replaced by the Nintendo Switch Pro Controller. It has the same overall button layout as the Wii U GamePad, in a more traditional controller layout, however it lacks motion control sensors, camera, NFC Pad, headphone jack and touchscreen. In the Battle Dojo, one player can use the Wii U Pro Controller to play on the TV, to pop as many balloons as they can, against their opponent, using the Wii U GamePad. This is the only functionality available for this controller in Splatoon. : Primarily used to move the player's Inkling forward, backward, left, and right. : Used for menus, such as the weapon select and pause screen. : Allows players to transform into squids. In this form, Inklings are able to move faster through their own ink and jump farther. : Allows players to splatter ink using their weapon. : Allows players to use their sub weapon. : Causes the player's Inkling to jump. : Resets the camera angle, allowing for quick corrections. : Used in menus to select specific actions and options. : Used to deselect a chosen weapon in the weapon select screen. : Can be used in Battle Dojo menus like the stick. : Used to pause and resume in in a Battle Dojo match, and adjust the controls on the weapon select screen. Multiple Pro Controllers and a Wii U GamePad can be seen inside the Battle Dojo hanging on the wall. There are three white controllers,a black controller and a white GamePad on the left side and two black controllers on the right side. 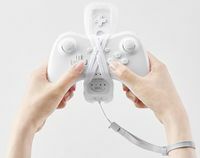 Battle Dojo matches can also be played with a combination of Wii U Pro Controller and a Wii Remote Plus or Wii Remote with a Wii MotionPlus accessory, which was hinted at in the 26th Sunken Scroll. (pictured below) This allows the player using the Wii U Pro controller to have motion controls. To perform this, the player must hold down on the , hold down , and press and as described on the Splatoon Tumblr, Live from Squid Research Lab. The Wii U Pro Controller being used in the Battle Dojo. Pro Controllers on the walls of the Battle Dojo. Sunken Scroll 26, depicting the remains of a human playing a Wii U. Note the Wii U Pro Controller with a Wii Remote attached to it. This page was last edited on 22 February 2019, at 11:45.